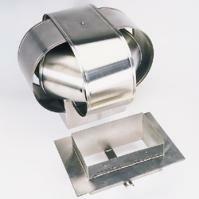 Yes, we have size options for WindBeaters for rectangular flues! The small Rectangular WindBeater fits flues with minimum inside dimensions of 6.25" X 10", and provides 146" of cross-sectional area. It comes complete with a masonry adaptor measuring 14" X 18". The large size is ideal for 12" X 16" flue tiles. The large Rectangular WindBeater fits flues with a minimum inside diameter of 10 5/16" X 14 1/4" and provides 146" of cross-sectional area. It comes complete with a masonry adaptor measuring 14" X 18". The large size is ideal for 12" X 16" flue tiles.